The consensus of earlier discussions was that these questions are on the low end, but not specifically disallowed. However, the last few months of experience have started to bias me against these questions, so much so that I think we need to reevaluate our decision to allow them. I'm now of the opinion that single word requests should be either disallowed entirely or subject to much more stringent requirements. I'm opening up the floor for voting on whether to ban single word requests entirely, or else for new guidelines that will help us separate the rare wheat from the depressingly abundant chaff. I think the key thing here is that we must require the asker to do some research. What would you call someone who makes no lasting impression? Question is a single sentence. 7 Answers, all but 2 are a single sentence. The remaining two are.. TWO sentences. Question is 6 paragraphs, includes link and an illustrative image. 6 answers, most are multiple paragraphs and blockquotes and sentences. It's clear that a lot more effort went into the latter question, and this site -- and the answers to that question -- are all substantially better for it. Great subjective questions inspire answers that explain “why” and “how”. Great subjective questions tend to have long, not short, answers. Therefore, questions which are extremely short, and inspire extremely short answers, are a bad sign -- how much can you truly teach or explain in a single sentence? Worst case, single-word-request is like playing Charades. "I'm thinking of a word. Three syllables." ... relevant bit being share your research. And if you haven't done any, should you even be asking here? I mostly agree with Martha. I like the intent behind these questions but I am not happy with most of them. My personal favorite is: Is there a word to describe a highly desirable cursed treasure? I feel that questions like that are perfect for this site. There isn't any way to look something like that up in a thesaurus and the concept described is extremely useful and interesting. Another good example is What's the opposite word for “sin”? This question isn't actually tagged as a single-word-request but it essentially is exactly that. Really, this tag is like any other. If we hack away at the "EL&U as thesaurus" perception I think we can turn it into an extremely useful category. Both my top question and my top answer are in single-word-requests, so I'm probably biased, but I strongly believe these are valid questions that should not be outlawed. Like all questions, however, context is king: the question needs to be as explicit as possible about the context where the word is desired, as well as why the words the questioner knows (if any) are inadequate to the purpose. Taboo — Guess away! I've got something really specific in mind, but can't tell you any of its synonyms. That would be cheating. Catch Phrase — It should start with an E and have three syllables and rhyme with "aardvark," but I'm not allowed to tell you that in my initial question. Outburst — Let's just list everything related to a topic! Pictionary — You're asking for the name of a species of tree? No, definitely a kind of cloud. Fuzzy request, yet looks like words. Well-defined, distinct concept with necessary context presented; not too limited. To answer will require a human, not just a reverse dictionary; an answer will need to not just list words but explain why a word or phrase is appropriate, and make associations that weren't easily searchable before. Doesn't ask us to do all the work; presents a practical problem showing effort at solving it (the proofreading example we don't accept, "are there any mistakes? ", is a lot like "can you rewrite this idea into a coherent word or phrase for me?" in terms of a bound on effort). "Could you tell us more about where you hope to use the word or phrase?" "For this type of question, we usually like to know a little more about the words or phrases you've considered. Can you tell us why [x] or [y] don't quite fit the meaning you're looking for?" When I see some of the questions tagged single-word-requests I always ask myself: Why is the OP limiting the answers to the one reporting a single word? Is there a practical reason for making single word requests, or the OP is just asking the question for amusement? As the OP generally doesn't know if there is a single word that matches the criteria reported in the question, I think that the limit of a single word should be removed; thus, questions should not be tagged single-word-requests. The second point should avoid situations where the OP doesn't describe too restrictive criteria, but then discard the suggested words for a non specified reason, such as "all words but that." On one hand, I personally loathe them; I don't think I've ever answered any. I hardly ever read those questions at all. On the other hand, what will be left of us if we throw them out? The only questions here that interest me are the ones about linguistics and style, with a few high-quality exceptions. If we forbid half of what we receive now, will we still be considered viable by our Overlords? And what if we threw out all other uninteresting questions too? As long as there are people who like answering these questions, perhaps we should keep them. Those questions are much of what we are about now. It is what many people liked when they joined us. Wouldn't we be doing them a serious injustice, if we suddenly changed policy so drastically? I think we should not allow single-word requests for synonyms and antonyms, at least. Asking for a word that means (or that means the opposite of) XYZ, where XYZ is a description, is typically not a problem. The asker has an idea in mind and lacks a word for it. This is different from a request for a synonym or antonym. I'm looking for another word for useless. I'm looking for a word that means the opposite of useful. Requests for synonyms and antonyms are something that can be easily googled for: foobar synonym. What value do such questions & answers on EL&U really add? OK yes, here someone answering might provide some context or describe different connotations, which can help. But such info is also available by looking up the definitions of the synonyms or antonyms returned by googling, and often the google search hits themselves go into the various shades of gray. My suggestion would be to forbid such questions a priori. Any given synonym or antonym request could still be judged to be a useful exception, of course. These questions are not practical, helpful to others, fair, or educational. In additional, these questions are inherently subjective and don't lend themselves well to a detailed, evidence-backed answer. As such, I am against single word requests. Since this question has been asked, the information in the tag about what is required has been expanded significantly. Use this tag for questions that are about finding a single word to fit a meaning. Describe the intended meaning, connotation, and/or context in as much detail as you can. This tag is for questions seeking a single word that fits a meaning. 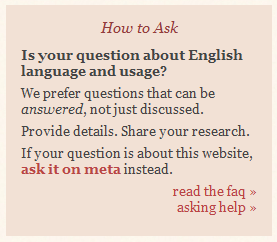 To ensure your question is not closed as off-topic, please be specific about the intended use of the word. YOU MUST INCLUDE A SAMPLE SENTENCE demonstrating how the word would be used. Please use the "phrase-requests" tag instead if you seek more than just a single word. Use this tag for questions that are about finding a single word to fit a meaning. Describe the word's intended meaning, its connotation (is it laudatory or derogatory? ), and/or its context in as much detail as you can. Questions that show no research are likely to be closed. It's also a good idea to show users how this single word fits in a sentence. What's the single-word for "left or right handed"? What is a word that means unforgettable but with a negative connotation? Is there a word, phrase, or idiom for a person who stays too late at an event such as a dinner party? If you can think of a word with a similar meaning, you should look it up in a thesaurus as part of your research. If there are any synonyms that seem close to what you're looking for, but not quite right, mention them in your question and explain why you don't think these words would fit. connotation: should the word be positive or negative? register or level of speech: should the word be formal or informal? part of speech: do you want a noun, a verb, or an adjective? Or would you be fine with a word in any of these grammatical categories? Does the question describe exactly in what context you want to use a single word? Does the question specify the criteria for which the suggested word will be accepted? Does the question list which words you didn't like, and why they aren't suitable? Does the question show that you searched for a suitable word before asking the question? In my opinion, this counts as "guidelines that will help us separate the rare wheat from the depressingly abundant chaff", and this question doesn't need to be featured in July 2017. EDIT: It's a long answer, I know. What can I say? I have free time on my hands. First, I like resolving single-word-requests, they make my brain tick. It's good healthy cerebral exercise. The higher, more intellectually demanding questions I leave to the linguists and to the real enthusiasts. Secondly, I believe they serve a purpose; many provide a rich source of information to visitors and they increase our vocabulary knowledge and understanding. Think of the number of times when we catch ourselves saying: "What's that word? It's on the tip of my tongue." I would like to think that any online research that asks: What's another word for [...]? Would lead that person to this site. Having said that, there are moments when I think single-word-requests are the curse of EL&U. They can be so badly written. A poorly phrased question, lacking content and context, a visitor demanding (!) a single-word at all costs; only results making users feel cantankerous and irritated towards the OP. Now compare the first version above with this single-word-request A women's accessory...what's the word? The answer was obvious but only because the description was accurate and detailed. The OP's question couldn't be answered by looking in a dictionary, so she came to ELU and immediately got the answer she was looking for. But I digress, above all single-word-requests are fun to participate in and really involve the whole community especially when the questions are; simple, grammatically correct and more importantly, open-ended. Look at this example Idiom for magic object (or idea) that fixes everything Yes, OK. It wasn't a single-word-request but the principle is the same and it drummed up a huge number of visits in two days. Personally, I had never heard of "a gold bullet" or "deus ex machina" before, and found the OP's question very useful. To sum up, single-word-requests are like the typical crossword puzzles you used to find in newspapers; they can be taxing and extremely hard to resolve but the pleasure and satisfaction in finishing one is immensely rewarding. But often they can be uninspiring, overly simplistic and bland. Hardly the stuff of vocabulary expansion. In writing this answer I was reminded of a comedy sketch entitled Crosswords by the British comedians; The Two Ronnies. (A comedy duo whose comedy routines I was not particularly fond of as a child but have recently rediscovered and now love.) I think we can all relate to the businessman's frustration (Ronnie Barker) with his fellow commuter traveller (Ronnie Corbett). Here's my suggestion: questions which are just single-word-requests should be off-topic. In other words, any question where the asker says merely "Please give me a word that means X" should be considered off-topic, as we're no longer in that business. This is the majority of word request questions. This is part of and parcel of the existing strategy to refuse copy editing and "name my variable" questions. It may be a challenge to word this requirement in a way which is clear to new users, however. Not the answer you're looking for? Browse other questions tagged discussion tags on-topic-off-topic single-word-requests .